NYX Total Control Drop Foundation - Is it Good ? 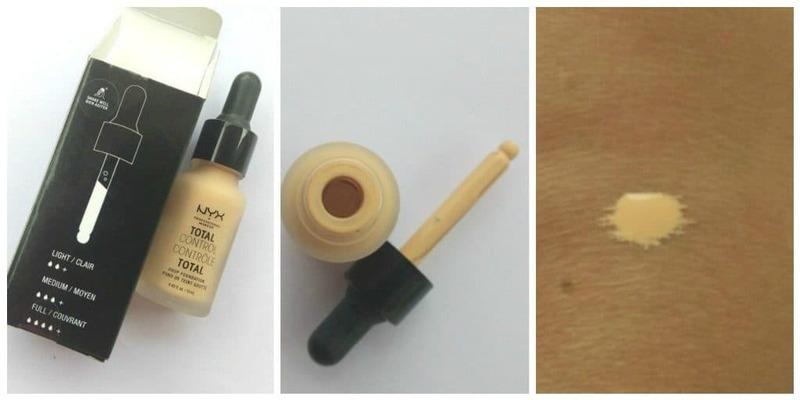 Home ReviewsBeauty NYX Total Control Drop Foundation – Is it Good ? NYX Total Control Drop Foundation – Is it Good ? Who is it for? NYX Total Control Drop Foundation is for those who are looking for a lightweight foundation with medium buildable coverage. It goes from light to medium coverage by adding more drops of the foundation for layering. Packaging: The packaging of this total drop control foundation is extremely classy, and hygienic. I loved the packaging. It is packed in a black colored paper box and the product comes in a beige glass bottle with a black dropper cap. 1/1 for the bottle. The words “NYX total drop foundation” are written in black on the bottle and the ingredients are written on the package. I have always wanted to explore the drug store brand which, in India is apparently not really drug-store, since it is pretty expensive and costs as much as a medium to high-end makeup products. I always wanted to try this particular foundation since I have read positive feedbacks about this product, but I didn’t know which foundation shade to choose. This is when I visited the nyxcosmetics.com website and took a shade finder test and I got the perfect shade of foundation that suits my skin. My advice to everybody reading this would be to go visit that site and find the right shade of foundation to match your skin tone. The idea is to look flawless and even toned, nothing more. I used 3 drops of this product, which gave me medium coverage and lasted a good 5 hours without flaking or feathering out. It didn’t clog my pores or irritate my skin and it didn’t make my skin oily. It is suggested to use 2 drops for light coverage, 3 drops for medium coverage and 4 drops for full coverage. So girls, in all, this product is a hit for me and I am in love with it. What are you waiting for? Go ahead and binge. A big yes. I definitely recommend this product to everyone, and of all age groups and of all skin types. It gives a natural, light to medium to full coverage which makes it apt to be used for any occasion. So girls, if you are looking for a foundation that blends like butter in your skin. Happy shopping!! Nature’s Essence Diamond Facial Kit – Good Buy ? You are right. NYX products are not drug store in India. They belong to mid-high end category.. This one seems to be a good foundation that can give good coverage according to the quantity used..